With Rio de Janeiro getting ready to host the Summer Olympic Games next year, the launch of a journalistic narrative exploring the contradictions of Brazil’s postcard city could not be more appropriate in time. “Dancing with the Devil in the City of God” (Simon @ Schuster), written by the Brazilian born reporter, Juliana Barbassa, will go on sale later this month in the United States and she will be speaking to the public in New York, in August 5th, at the Americas Society. The book shows Rio through the privileged author’s perspective: a native “carioca” who left Brazil during the “lost decade” of the 1980’s only to find, 20 years later, as an Associated Press (AP) correspondent, a resurgent city on the eve of an economic boom. Since 2010, Juliana has seen Rio undergo huge transformations thanks to the offshore oil discoveries, the social government programs and the infrastructure work in preparation for the World Cup, and now, the Summer Olympics and Paralympics. Beneath the surface, however, Juliana finds the persistence of social challenges that Rio has to overcome. 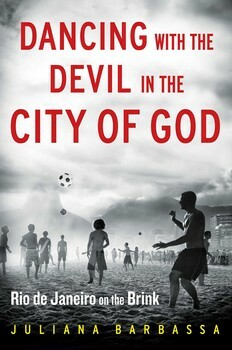 “Dancing with the Devil in the City of God” is built around the diverse accounts of the city’s inhabitants, from slum dwellers to authorities, therefore enabling the reader to make his/her own conclusions of how Rio will rise to the occasion.